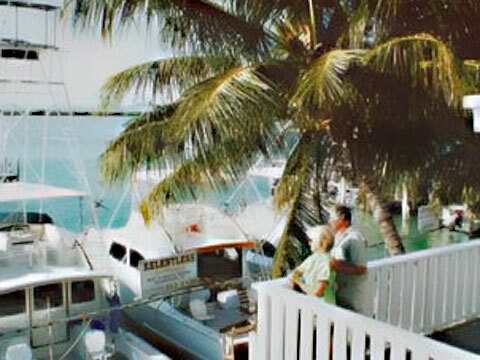 Bud N' Mary's is a world famous sportfishing marina located in Islamorada, the heart of the beautiful Florida Keys. Whether you're an experienced world class angler, or a novice about to have his or her first fishing experience, you have come to the right place. Alone, a couple, a small group, or a large corporate group, we can help you have the fishing adventure of your life. We have a great Islamorada motel, perfect Florida Keys Lodging for fishermen! Florida Keys fishing is spectacular, especially when Islamorada fishing trips take place! Bud N' Mary's is home to over 40 of the finest offshore captains and backcountry guides to be found anywhere in the world. They have been the subject of countless magazine and newspaper articles, appeared in numerous television shows, and fished everyone from past presidents, movie stars, atheletes, and the like. However, they have earned their reputation one day at a time taking out ordinary people like yourself to share their passion for fishing and the outdoors. We hope you enjoy our new website, if you notice any problems please drop me an email (only questions/comments related to the site, please!) and if you'd like more information about the marina and what we offer, please call us at 1-800-742-7945 or email us. Islamorada Fishing HQ Florida Keys Fishing at it's finest! Islamorada Fishing Charter central! Bud N' Mary's Backcountry Fishing Expeditions offer the light tackle enthusiast a chance to capture an amazing variety of gamefish. Fly fishing, spin, or plug tackle enthusiasts can enjoy some of the most exciting "skinny" water fishing trips in the wide world of angling. The confluence of the Everglades, Florida Bay and the Atlantic Ocean provide the perfect habitat for Bonefish, Tarpon, Permit, Snook, Redfish and Trout on the seemingly endless flats that are only minutes away from the dock. The acrobatic antics of a possible world record "Silver King," the screaming drags that signal the sizzling runs of Bonefish and the nearly nonstop action of Trout and Ladyfish are just some of the excitements you can expect when you fish with our world renown Backcountry Guides. All levels of anglers will know that they've truly found the Valhalla of fly and light tackle fishing. You are right in the picture when you stay at Bud N' Mary's Fishing Village. Absorb the atmosphere of the Keys Ã¡ la Hemingway, Writer Zane Grey, and The Splinter, Ted Williams. We have picturesque rooms and several charming efficencies overlooking the ocean's sunrises and sunsets, as well as our fleet of 44 fishing boats--a glorious sight! As you might expect, we have a colorful group of fishing buddies who can regale you with tales of glory and how big it really was! All rooms have TV, TELEPHONE and AIR CONDITIONING. All reservations require a deposit that is non-refundable within 30 days of stay. The deposit amount depends on the length of stay. Dockage is usually always available for our guests at an additional charge of $2.00/ft per night. Generally we do not have room for people to store trailers, however if you call and check with us we may be able to accommodate you if it is not a very busy time. Bud N' Mary's Backcountry Fishing Expeditions offer the light tackle enthusiast a chance to capture an amazing variety of gamefish. Fly fishing, spin, or plug tackle enthusiasts can enjoy some of the most exciting "skinny" water fishing trips in the wide world of angling. The confluence of the Everglades, Florida Bay and the Atlantic Ocean provide the perfect habitat for Bonefish, Tarpon, Permit, Snook, Redfish and Trout on the seemingly endless flats that are only minutes away from the dock. The acrobatic antics of a possible world record "Silver King," the screaming drags that signal the sizzling runs of Bonefish and the nearly nonstop action of Trout and Ladyfish are just some of the excitements you can expect when you fish with our world renown Backcountry Guides. All levels of anglers will know that they've truly found the Valhalla of fly and light tackle fishing. Bud N' Mary's Fishing Marina, which has been located in Islamorada, the heart of the Florida Keys since 1944, can truly be called the "Sportfishing Capital of the World." It's geographical location is totally unique in that it offers a wide spectrum of fishing to be found no where else in the world. In fact, nearly every species of salt water gamefish found swimming in this hemisphere can be caught from nearby locations. Blue water anglers employ everything from fly tackle to trolling gear to plumb the depths of the nearby azure blue waters of the Gulf Stream for acrobatic Sailfish and Marlin, hardfighting powerful Tuna, blue/green/golden hued Dolphin, razor-toothed Wahoos, giant Tiger and Hammerhead Sharks, and irridescent King mackerel. Deep water reefs offer tackle breaking giant Groupers and the frisky, fighting, good eating Yellowtail Snappers. All this fishing action is found only minutes away from the Marina and is noted on the Fisherman's Calendar. With seasonal runs overlapping, there's always a wide variety of exciting fishing to leave anglers with a lifetime of memories. From novice to experts, Bud N' Mary's Marina has something to offer everyone throughout the year. Bud N' Mary's can customize fishing trips for your group, depending on your size, interests, and budget. We work with many large groups throughout the year, most of which plan annual or semi-annual fishing trips for their companies. We help them work out all the details to ensure their trip runs smoothly, and make their stay in the Florida Keys a memorable one. They keep coming back because we have some of the best fishing in the world, a skilled and friendly team of captains, and a unique marina with an ideal location in Islamorada! Many participants in these groups come back on their own because they've had such a great time! We have a long history of great fishing, come and be a part of it!